Expected to be unveiled at the Unpacked event that will take place in less than a week in San Francisco, the Samsung Galaxy S10+ has recently surfaced on Geekbench. 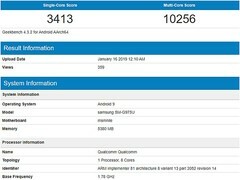 The model spotted in the popular benchmark database is labeled SM-G975U and sports a Qualcomm Snapdragon 855 processor, 6 GB of memory, as well as Android 9.0 Pie-based firmware. The new Samsung Galaxy S10 will arrive in less than a week, and probably at least one of the models that will be revealed will have a foldable design. The Samsung Galaxy S10+ is not expected to be foldable, but even if it uses this new design approach, the Geekbench database entry does not show it. However, the popular benchmark database confirms a few highlights, namely the processor, Android version, and amount of memory. 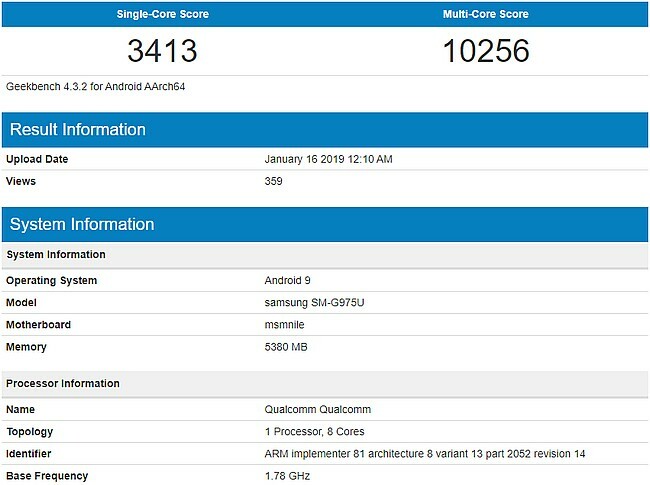 The aforementioned Geekbench listing involves the Samsung Galaxy S10+ with model number SM-G975U and the following key specs and features: Qualcomm Snapdragon 855 processor, 6 GB of memory, Android 9.0 Pie-based software (almost certain with Samsung's One UI on top). Those who think that 6 GB is not enough should be aware that an 8 GB variant is also in the cards, at least according to some leaks and rumors, and it would not be surprising at all to see them both reaching the market simultaneously. The Geekbench database does not reveal any information about the amount of storage available on the SM-G975U tested, but it is rumored that the Samsung Galaxy S10+ will come with up to 512 GB in this department. The Qualcomm Snapdragon 855-powered Galaxy S10 units will target the US and a few other markets, while most areas of the world will get the new flagships with the Exynos 9820 inside. Finally, it is also worth mentioning that the 6.4-inch display of the upcoming Galaxy S10+ is expected to integrate a fingerprint reader. These being said, we should all get ready for Samsung's February 20 big event. Do you have any special wishes from the upcoming Galaxy S10 series? Feel free to share them with us in the comments section.